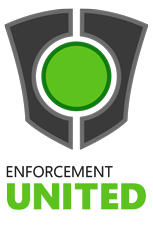 On August 1st, Microsoft released Xbox Enforcement United. 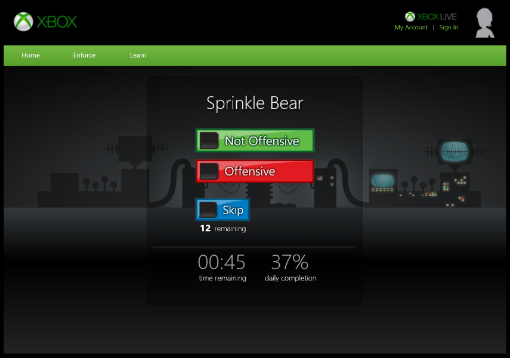 The new program allows users to determine whether or not players are violating the Xbox Live Code of Conduct. A beta version of the program is available now. As for now, XEU is only available to Xbox Live Ambassadors who meet age, Gamerscore, and Xbox Live requirements. Microsoft plans to open the program up to a larger chunk of the community once the beta comes to a close. If you take part in the program, you will be asked to identify questionable content as it relates to profane words/phrases, topics or content of a sexual nature, hate speech, sensitive historic/current events, as well as various "sound alike" or "look alike" words or phrases, potentially masked by l33t speek, phonetic tricks, or multiple languages. Your opinions are then sent to the Microsoft Enforcement team to determine if action needs to be taken against an user. It looks to me like it is a very simple interface. Three buttons to be exact. It also looks like you have a set time limit for either each gamertag or each day. I think they could add more to the overall look of the program. Especially the background. To me, that is very bland and unappealing.